← Pie Crust Update — and Dutch Apple Pie! It’s no surprise that I’m a bit obsessive about making things from scratch. And I first tried my hand at homemade marshmallows a couple of years ago. Inspired by an upcoming camping trip, I had visions of roasting campfire marshmallows until good and charred then smushing them between graham crackers and oozy chocolate. So, I dutifully followed a recipe — boiling sugar, mixing with gelatin, whirring in my stand mixer. The instructions said I should leave the mixer alone to whip for 10 minutes. Of course, I thought that would be a perfect opportunity to quickly walk the dog. Well, I knew something was amiss as soon as I stepped in the door and heard the weird sound. While Oliver and I were happily, blissfully ignorantly, trotting down the street, the mixer had inched itself off the counter. I found it laying on its side — still whipping! — against my hardwood floor. There was marshmallow everywhere. Every.where. And I was cleaning it out of every nook, cranny and crevice in my kitchen for days. I still have the gash in the floor to prove it. But don’t you know I salvaged what was still left in the bowl and made marshmallows anyway, albeit thin ones. 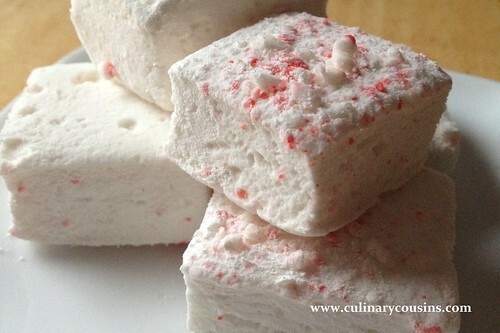 Once you taste a homemade marshmallow, there’s no going back. The texture is smooth and creamy, yet spongy and light, with a beautiful vanilla sweetness. Like eating a cloud. I don’t really like marshmallows, but I love these. 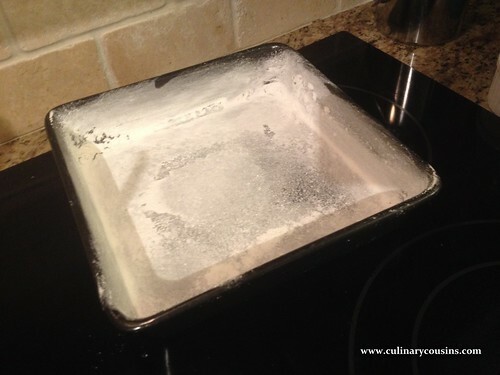 Lightly grease a 9×9 square pan or 9×13 baking dish with vegetable oil, then sift a couple of tablespoons of powdered sugar into it and tap it around all sides to “flour” the pan. Discard any extra powdered sugar. If you’re using a stand mixer, add the gelatin and 1/2 cup cold water to the mixing bowl, stir and set aside for five minutes. If you don’t have a stand mixer, you can use a hand mixer, so combine the gelatin and water in a large bowl. In a medium saucepan with the candy thermometer attached, stir together the other 1/2 cup of water, sugar, corn syrup and salt. Bring to a boil slowly, gradually turning up the heat as the sugar dissolves. 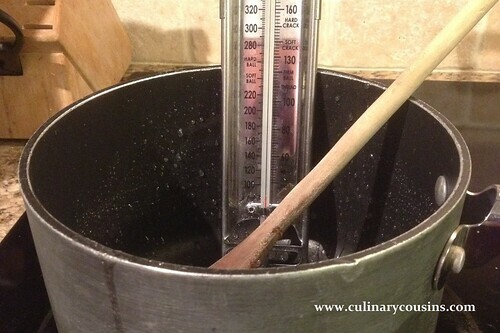 When it starts to boil, watch the candy thermometer until the temperature reaches 240°. Remove the thermometer and set aside. Back to the mixer. VERY carefully pour the hot sugar mixture on top of the gelatin in the mixing bowl. Turn the stand mixer on low and stir until all the gelatin is dissolved. Slowly turn up the mixer speed to high, and let it beat for 6-10 minutes, until it’s tripled in volume and is white, shiny and thick. The consistency of marshmallow creme. Meanwhile, add the two egg whites to another mixing bowl and with a clean pair of beaters, whip them until the whites have stiff peaks. If you’re using one hand mixer, do this in advance. If you’re using a stand mixer, you can use a hand mixer to do this part. “Stiff peaks” mean that when you stop mixing and dip the beaters into the eggs, the points that form are stiff and don’t fall over or move when you turn the beaters over. Be careful not to beat the eggs past this stage or they’ll “break” — they’ll look dry and sort of separate. Then they’re no good to you. 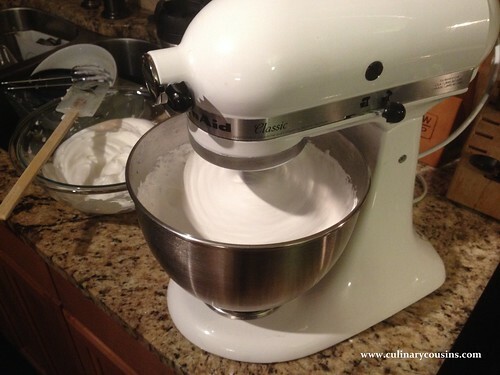 Once the marshmallow creme has whipped to the right consistency, turn off the mixer and pour in the egg whites. Whip for another minute until the egg whites are completely absorbed. Pour the marshmallow into the prepared pan. Just to be extra festive for one batch, I crushed up a candy cane and sprinkled it over the top at this point. That’s totally optional. 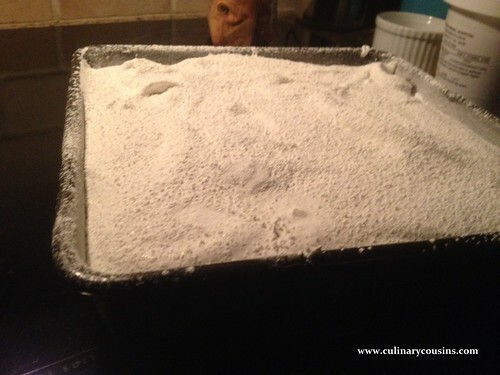 Dust the top with sifted powdered sugar. 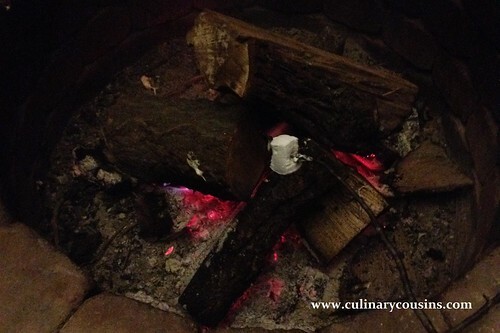 Let the marshmallows sit for several hours on a cool counter or in the refrigerator. When ready to cut, peel the marshmallow out of the pan. Rub a knife or cookie cutters with oil and cut into your desired shapes. In another pan, add about 1/2 cup of sifted powdered sugar and toss each marshmallow in the sugar to make sure all sides are coated. This will prevent your marshmallows from being too sticky to handle.